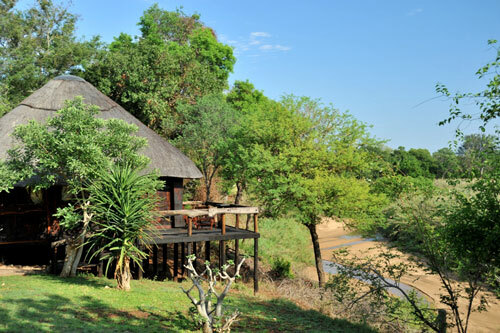 The truly luxurious River Lodge is set upon the fertile bank of the Makhutswi River and offers the comfort of 5 star accommodation. 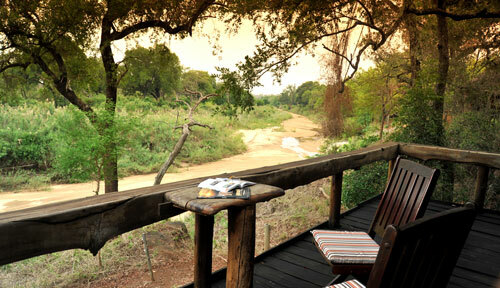 A private watering hole that is home to many hippo and crocodile can be enjoyed from any of the 13 exclusive suites. morning, afternoon and evening game drives. The luxury suites are designed to suit couples who want five star luxury with en-suite bathroom and total privacy. 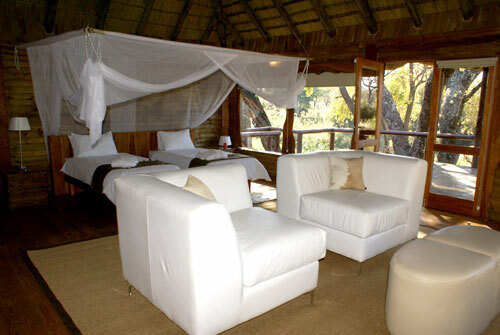 They also offer you spectacular views, wonderful wildlife sightings and the sound of the African bush. 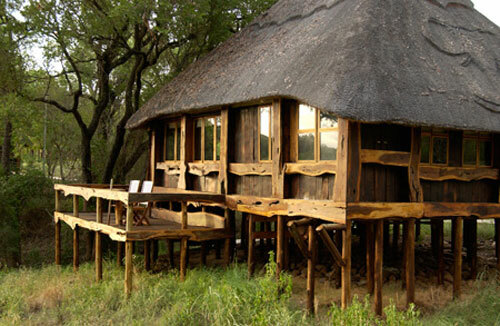 Each room is built entirely from indigenous wood and has its own deck overlooking the magnificent Makhutswi River. These suites offer sumptuous decor and fittings, remote air-conditioner, ceiling fans, bar fridge and the facility to make tea or coffee. The bathroom has a beautiful dressing table, jumbo shower and the ladies favourite, a Victorian bath. The family suites have been designed to accommodate families of four but can also accommodate five with the inclusion of a babies cot. Like all other accommodation types at Safari Lodge these are also built out of indigenous wood with their own private deck looking out across the camp onto the Makhutswi River. In addition 2 magnificent executive suites have been designed and furnished to satisfy those who want only the best. Inside, a remote controlled air-conditioner gives you the desired tempreture you need during the hot summer and the cool winter months. 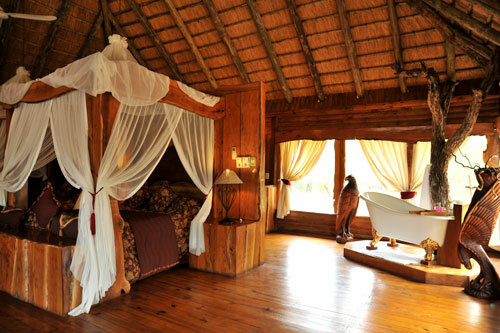 Each suite offers two queen size beds draped with mosquito nets. The bathroom is stunning with the Victorian bath being a main feature. The magnificent "Presidential Suites" are designed for those with superior and exquisite taste. These spacious and private rooms offer sumptuous decor and furniture to satisfy the best of connoisseurs. Enjoy your own splash pool whilst sipping on a cocktail or lay back on a comfortable deck-bed and enjoy the wonderful sounds of the African bush or watch hippos and crocs go through their daily routine right in front of you in your own private water hole. Room service for meals and special drinks are only a push of a button away on your private radio which puts you constantly in touch with the efficient Edeni staff. These wonderful people are committed to make your stay one that you will treasure forever. Our specially trained game rangers and trackers will take you on day and night drives in comfortable open four-wheel drive landcruisers. Most of the rangers and trackers are Shangaan and bring to the game experience the richness of their culture and vast knowledge of nature. With their natural tracking abilities and Karongwe's modern bush telegraph, our rangers will go out of their way to bring you as close to the Big Five or even the Magnificent Seven (lion, leopard, elephant, buffalo, rhino, cheetah and African wild dog) as they possibly can. On one game drive you may stop an arms-length away from a leopard napping after a kill, disembark and walk just metres away from a couple of cheetah or stop in the middle of a pride of lions, observing the king of the jungle watching over his frolicking cubs. At all times, care and consideration for both guests and wildlife is of utmost importance.